A photo captured in SoHo, New York City, framing a metal sculpture and black-cat painting on a wall. 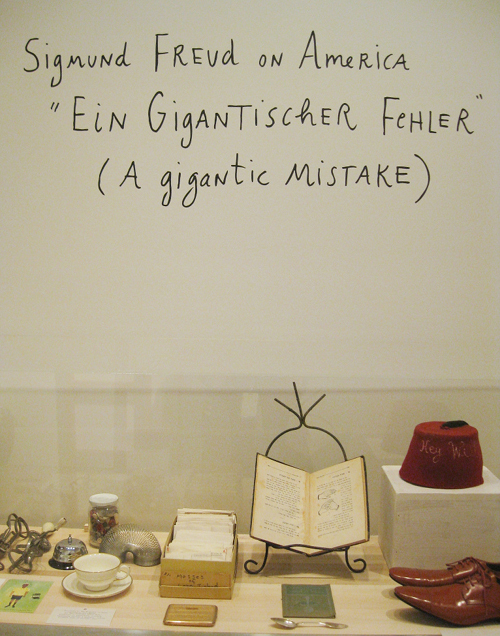 Today we visit another local exhibition that will be closing soon, Maira Kalman: Various Illuminations (of a Crazy World) at the Contemporary Jewish Museum here in San Francisco. In addition to seeing the exhibition itself, I also attended the opening in July. Kalman is perhaps best known for her many covers for The New Yorker magazine, as well as her illustrated blog for The New York Times. Indeed, looking at her many illustrations on paper in the exhibit, one of the first things that comes to mind is “these look like New Yorker covers”, both in the style of the illustrations and the satire of life and people in New York. Many of the names in the map play on inside jokes about the stereotypical residents of boroughs or specific neighborhoods, rather than on the actual names themselves. I would have liked to see “Tribecastan”, as the name seems like it could in fact be from central Asia. The above work, Woman with Face Net, is the iconic work from the exhibit, and on opening night many of the female staff and volunteers at the museum wore similar hair nets as a tribute. It is interesting how the image uses the combination of red and black, which for me personally is quite powerful, especially in the context of female fashion and dress. In addition to the works on paper for publication, the exhibition presented some of Kalman’s text and installations, which feature numerous household objects. I particularly liked the juxtaposition of this set of objects with the caption in the background. It was not clear of this combination was the work of the artist herself, or of the curators. 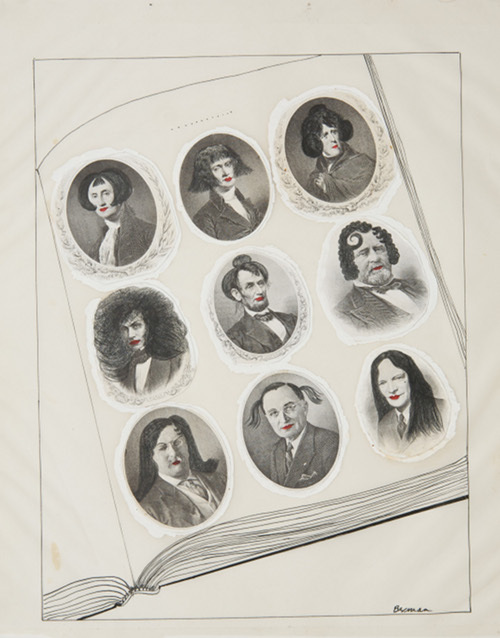 There were also some older pieces from her long career, including this “remix” of former U.S. Presidents with new hairstyles. Patriotic themes, at once both genuine and satirical, were a common theme among many of her works, and is the theme of one of her blogs at The New York Times, along with the scenes of life in New York. There are also scenes of her childhood in Israel – one image of a young girl in front of a Bauhaus building Tel Aviv was perhaps my favorite in the entire exhibition. She definitely has a soft spot for dogs, especially her dog Pete, who is presented very affectionately in many of the illustrations. Others were more abstract, still life of individual objects, or figures taken out of any environmental context. I did like this page of individual sketches that reduced many of the themes to icon form. 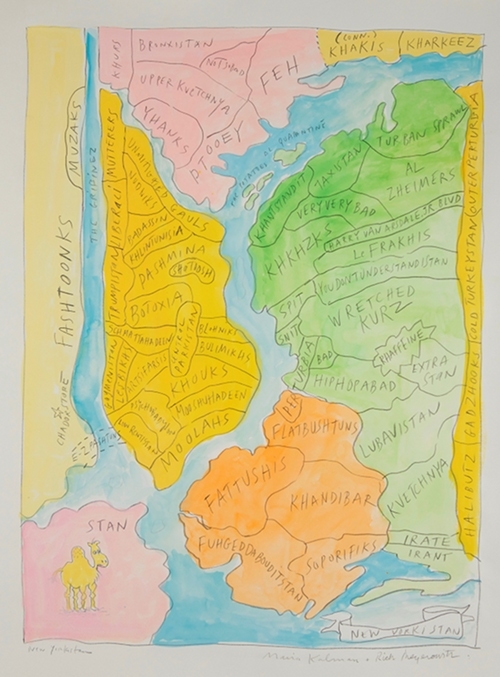 Although her drawing style is quite different, it made me think of the William Leavitt exhibit I saw earlier this year. I also had the opportunity to attend a live discussion with Maira Kalman on the night of the opening. Above all, I recall her being quite funny – not surprising given her illustrations, but she specifically had that dry sense of humor I tend to appreciate. As a blogger, I did note how she described the medium with a bit of derision, even while she had embraced it. 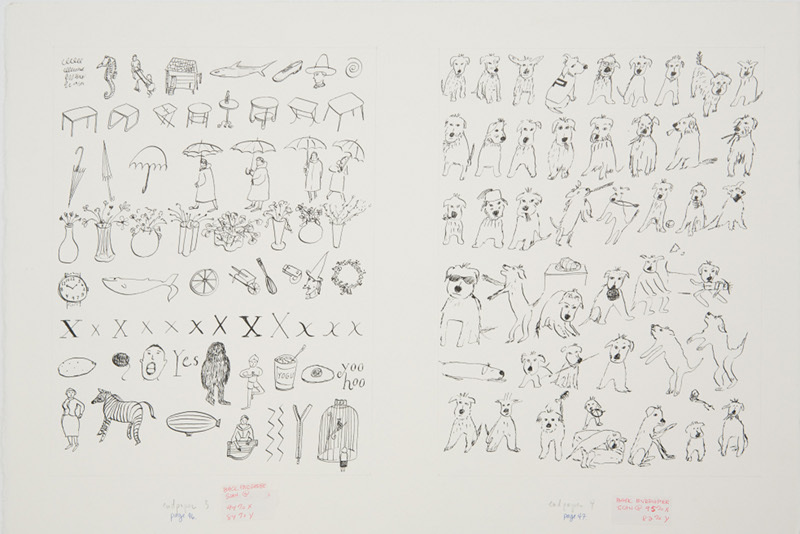 At the same time, she displayed a very sentimental side, when talking about her dogs, and her late husband Tibor Kalman. And her recommendations on how to pack lightly for traveling were simultaneously practical and romantic – something to keep in mind for future trips abroad. One interesting question that arose during was whether this could be considered a “Jewish exhibition”. While not originally conceived as such, it has taken on that identity in part because of the institutions where it being presented. After leaving the CJM, it be at the Skirball Center in Los Angeles, and then at the Jewish Museum in New York. There is rarely a satisfactory way to answer a question like that, whether the heritage in question is Jewish or anything else. For example, similar questions arose for Stella Zhang’s 0 Viewpoint about whether it was “Chinese art”. 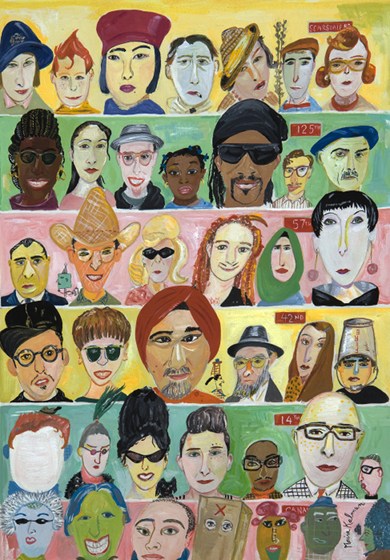 Maira Kalman: Various Illuminations (of a Crazy World) will still be open at the Contemporary Jewish Museum until October 26.